Tiffany previously had warned of soft sales in the holiday season. 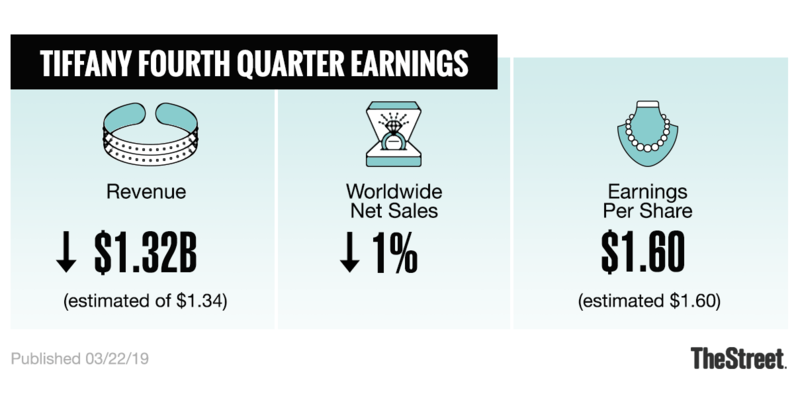 International headwinds turned out to be too much for Tiffany (TIF - Get Report) as the jeweler reported soft holiday quarter sales on Friday, but the stock was gaining 2.7%. The New York-based company reported fiscal fourth-quarter net income of $1.60 per share on revenue of $1.32 billion. Analysts were looking for earnings of $1.60 per share on revenue of $1.34 billion. Tiffany had predicted soft holiday quarter sales due to low spending by Chinese tourists and weakness in Europe. Worldwide net sales fell 1% in the period. "Softer trends in the second half of the year reflected, in part, what we believe were external challenges and uncertainties," CEO Alessandro Bogliolo said. "Most important, we are still in the early stages of a journey to achieve long-term sales, margin and earnings growth for this legendary brand."